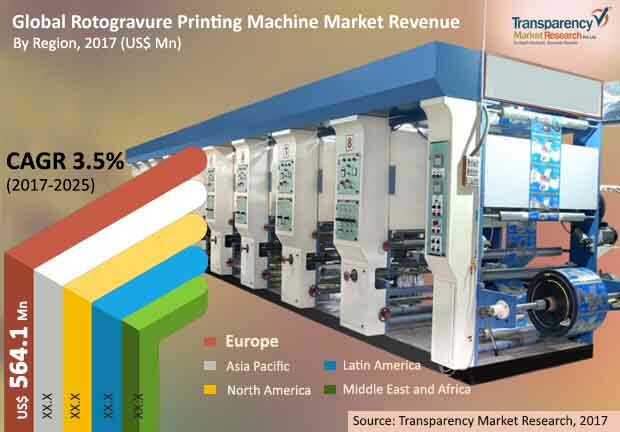 TMR analysts state that the revenue generated from sales of Rotogravure printing machines for retail merchandising has been estimated to be around US$1.63 bn in 2016, and is projected to expand at a CAGR of 3.5% during forecast period 2017-2025, rising to a valuation of US$2,208.55 mn by 2025. Of the key industries that utilize Rotogravure printing machines, the food industry is expected to dominate the market throughout the forecast period. The market is also expected to see major gains across the pharmaceutical and security printing industries over the forecast period, which are anticipated to register impressive CAGRs of 4.6% and 4.0%, respectively, over the report’s forecast period. APAC is expected to overtake the Europe rotogravure printing machine market and dominate the global market by the end of forecast period, in terms of both value and volume. The market in the APAC region is estimated to have an annual consumption of 7,533.68 units of rotogravure printing machines in 2017, and is predicted to up the consumption to 9,578.39 units by the end of the report’s forecast period.